Check out research opportunities with the following Origins faculty members. Many other opportunities exist in addition to those listed here. If you are a student looking for a research opportunity in an area not listed here, please email origins@case.edu or evolution@case.edu to inquire! Students are full participants in cutting edge research -side by side with top scientists- to investigate everything from the big bang to the developing mind and emerging life. Students may be involved with ISO scientists’ research across diverse disciplines for as little as a few weeks or for a longterm research partnership that may last through a student’s 4-year undergraduate career and in some cases beyond! The ISO Fellows listed below have asked that their names be made available to students interested in working in labs and research programs. Students may be involved variously as volunteers or paid assistants (with or without work-study). In addition, many scientists are open to having students work with them but don’t have a specific position or project in mind at the moment, so please feel free to contact any of the ISO Fellows listed on our Fellows page if their area interests you. They may well have something you can work on. For summer research, students can apply through SOURCE, specifying that they would like to be placed with an ISO Fellow. Scientists’ names marked with an asterisk (*) below have indicated particular interest in having students for summer 2018. This research focuses on engineering functional biologic replacements to repair damaged or diseased tissues in the body. Dr Burt is Curator and Head of Dep. of Human Health and Evolutionary Medicine at Cleveland Museum of Natural History. The Department has recently started a Biorepository for hard tissue biological specimens where researchers can curate their samples. Dr. Burt is beginning a new research program on Infant Feeding Practices in Cleveland using stable isotope analysis in combination with other techniques. Recently, Dr. Burt published Origins: An Evolutionary Journey with Co-author Dr. Mindy Pitre and Illustrator Holly Hunold. Origins is an educational game that teaches the concepts of evolution and the fundamentals of human origins through classroom play. Dr Covault has diverse interests, including Experimental Particle Astrophysics, Gamma-Ray Astronomy, Ultra-high Energy Cosmic Rays, and extraterrestrial intelligence. Dr Croft is a paleontologist who specializes in extinct South American mammals. He works with many undergraduate researchers. Dr Cullis is the Francis Hobart Herrick Professor of Biology. He uses plants as model systems to investigate the mechanisms by which DNA within the cell can change rapidly, particularly in response to external stimuli. Dr Decker’s current research in the laboratory of cerebral blood flow & metabolism is based on the study of the molecular mechanisms that regulate capillary structure/function as a component of the neurovascular unit. Associate Professor of Applied Mathematics. Dr Harvey is the Principal Investigator for the Antarctic Search for Meteorites program. His interests are diverse, including among other things various processes on Earth and Mars and the geochemical and climatological limits on biological activity in cryogenic settings. Dr Jones is Director of Science, William A. and Nancy R. Klamm Endowed Chair of Ornithology, and Curator and Head of Ornithology at the Cleveland Museum of Natural History. He is an expert on birds and their evolutionary history. He specializes in comparative phylogeography, a field that compares the geographic patterns of genetic variation among populations of a species with those of other species occupying the same habitat. Dr. Jones can involve students in diverse areas of research in both the museum and the field, for varying lengths of time. He can also help point students to other areas of research available at the museum. Dr LaManna’s current research in the laboratory of cerebral blood flow & metabolism is based on the study of the molecular mechanisms that regulate capillary structure/function as a component of the neurovascular unit. The Manot Cave is a unique archeological site located in northwest Israel. It contains what may well be indications of Neanderthal and H sapiens cross-breeding. It is an active karstic cave with remains of human occupation during the Middle and Upper Paleolithic periods. These remains document the dispersion of modern humans from Africa to Eurasia and seeks to uncover the physical and cultural affinities of the ancient dwellers in the cave, through a multi-disciplinary research project involving an international and diverse group of scholars. Dr Mathur’s interests involve Theoretical Physics: Condensed matter physics, Particle-Astrophysics and Cosmology. Dr Mizutani’s work addresses how gene expression patterns arise and how they evolve to produce different tissues and life forms. Dr. Ritzmann’s research is aimed at determining how animals move through the kinds of complex terrain found in natural settings. A great model organism has been the cockroach. His data are also used in efforts to design and build hexapod robots that can navigate extreme environments on earth and other planets. Dr Ryan is Curator of Vertebrate Paleontology at the Cleveland Museum of Natural History. His on-going expeditionary research includes remote locations in Africa, South America, Canada, and Mongolia, with a focus on ceratopsian dinosaurs. 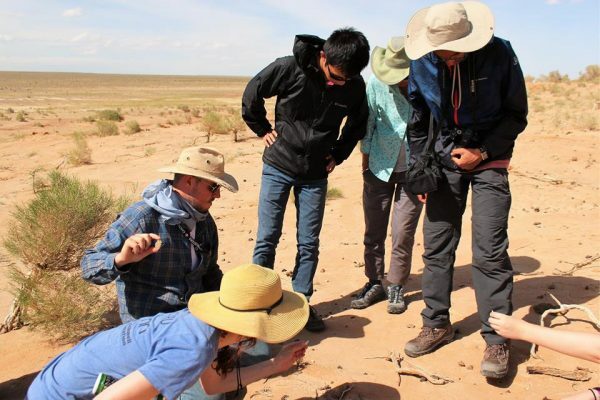 Dr Saylor’s research focuses on reconstructing and interpreting stratigraphic patterns, both as recorders of past environmental and tectonic change, and as transport pathways and reservoirs for fluids. Dr Starkman’s interests lie in Theoretical Physics: Cosmology, Particle Physics and Astrophysics, including issues such as challenges to and the sufficiency of the standard model, dark matter, and the microwave background. The goal of Dr Thomas’s research is understand signal transduction from a biophysical and information theoretic point of view. Partial funding may be available to help a student accompany Dr. Isaiah Nengo and Dr Patricia Princehouse to the famous Turkana Basin in Kenya where so many famous hominid fossils have been discovered. The goal of Dr van den Akker’s research is to elucidate the molecular intricacies of enzyme mechanism and receptor activation and use that knowledge to develop inhibitors and activators for pharmaceutical purposes. Dr van Orman’s research concerns geochemistry and mineral physics, including planetary interiors and the evolving early solar system. The Willis lab studies mechanisms of insect behavior, especially how animals use odors to locate mates, food, etc.Ands also how moths’ nervous systems coordinate with their flight muscles while they are flying in order to begin to understand how the central nervous system controls flight.